The Environment Agency has accepted an Enforcement Undertaking from Wessex Water, in the first case where a civil sanction has been used against a water company. The offer includes actions for Wessex Water to improve its operations and infrastructure, as well as financial contributions totalling £25,500 to environmental organisations and those affected by the offending. It follows a major pollution incident in Bristol on 11 July 2013, when a blockage in a main sewer resulted in raw sewage being discharged into the River Trym. The volume of sewage which entered the river had a large impact, with 112 eels, 200 sticklebacks, 1000 bullheads all found dead as a result of the pollution and an estimated 90% of river invertebrates also killed. The incident was reported to the Environment Agency by concerned members of the public who had seen dead and struggling fish floating on the surface of the water. Officers from the local Environment Management team responded quickly to the incident by attending site and informing Wessex Water, who took steps to stop the polluting discharge and prevent further loss of aquatic life. In the following few days, the Agency and Wessex Water continued to monitor the river, sample the water, and survey the river to fully assess the impact the pollution incident had on invertebrates and fish life. A CCTV survey of the sewer carried out by Wessex Water found that the cause of the blockage was a build-up of fat and grease, which had found its way into the system. Businesses who commit an offence under the Salmon and Freshwater Fisheries Act 1975 (SAFFA) by discharging polluting matter into a water course and kill or threaten fish and other aquatic life are able to offer an Enforcement Undertaking (EU) as an alternative to prosecution or other sanction. In any EU, the offender must offer to restore/remediate the harm caused by the offence, or where that is not possible, make a financial contribution to a recognised environmental charity or project to achieve equivalent environmental benefit. The offender must also demonstrate it will change its behaviour and ensure compliance with environmental legislation. This was accepted from Wessex Water because it was felt a more proportionate response, that would benefit the environment. We did initially consider prosecution due to the serious environmental harm it had caused. However, the company then submitted an Enforcement Undertaking (EU), which we subsequently accepted, as we considered it was a more proportionate response and that it would achieve more for the environment than if the company had been convicted and fined. and payment of our costs. Failure to comply with an EU may result in the offender being prosecuted for the original offence. 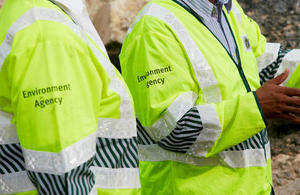 Details of Enforcement Undertakings accepted by the Environment Agency between February and May 2014 can be found on GOV.UK.